Yesterday I finished the “watermelon” striped socks. Aren’t they pretty? 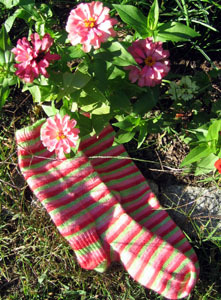 Isn’t it nice that I have zinnias to match the socks? Can I just tell you that Vesper sock yarn is addicting? You think Kidsilk Haze is crack? Wait until you try this stuff! If you can ever get it because it sells out incredibly fast. I set a new land/speed record on sock 2 since I had only cast the thing on last Thursday. How did I accomplish this freakishly fast knitting of sock 2? (Well, freakishly fast for me, anyway.) I owe it all to Julia. And Magic Loop. If you haven’t tried it, you need to give it a go. Find yourself a knitter who uses the technique and is willing to show you or buy yourself the booklet. Knitting with the Magic Loop, it’s a good thing. I also want to show you the bee-ay-u-tiful bracelet that Heather made for me. She also sent me stitch markers. Very chi-chi, no? Mine were presents (just because she likes me so much) but you can buy your own from her if you go look here. The Eyelet Cardi is done but the neck is wonky in the back so I’m not showing it to you yet. I may be ripping a bit and re-doing the neck if I can figure out how to fix it. Kiri still mostly looks like a lunch lady hairnet and there are new Trekking socks on the needles. Magic Loop, of course. Finally, a big shout out to my friend Betty who has started her own blog. Betty lives (and yarn shops) in NYC and is a fellow reenactor. She’s also a Jimmy Buffett freak and a great knitter. Go say hello, will ya? Oh my…….those socks are wonderful and the flowers just gorgeous! All kinds of pretty things in your post today, what fun. I’ve been wanting to try M.Loop, but don’t have the right needles yet. Glad ot hear another good review of it. If I had known there was going to be a Magic Loop lesson at The Sheep Shack I would have stayed later and work be damned the next day. I absolutely love the colors in the socks, pink and green together is one of my favorite combos. What a great colorway on the socks! I love my dpn but any way that helps you knit socks is good. Glad you like your pretties. I love the Magic Loop method, and learned it off a website. (I don’t remember which one, of course, but just did a google search until I found a good tutorial.) I like it better than DPNs and SOOO much more than the 2-circ method, which drives me nuts, with all those dangling ends. Your colorway (and zinnias) is beautiful. I use either magic loop or two circs – I like two circs because then I can do two socks at once – which technically you can do on dpns and ML but I’m just not ‘with it’ enough to remember to alternate between yarn balls every other stitch – with my luck I’d screw up and have two socks stuck together with that one stitch! The socks are great! Yay for the Magic Loop (I use two circulars myself – very similar.) I’ve been trying to get me some of that Vesper Sock yarn, but it’s always sold out! Very, very cute socks. Ditto on the Vesper — they are always sold out. That sock did get finished fast — yea for the Magic Loop. Nifty socks. You have me tempted to give the magic loop a try. I can’t imagine it being faster than my zippy dpn’s though. Call me skeptical. My first shout out! I’m so psyched! I just love the Vesper socks. Makes me want to start mine, but I’ve got to make more progress on the gift knitting first. I love the socks. I have tried to order that sock yarn in the past, but have never gotten lucky. Drat! Oh no Carole, they are sold out!!! !